With a dreary and cold start to another week of classes, many students were disappointed when their alarms went off today on time and the much wanted delay of classes text never arrived. Today, the high was around 38 degrees F and about 0.20 inches of rain fell. Winds stayed light from the east and total cloud cover remained consistent throughout the day. It was the perfect day to curl up in bed with a nice book and cup of tea! Temperatures stay right about freezing throughout the night, and drop below freezing in the early morning tomorrow. A slight break in rain is expected between 7 p.m. and 10 p.m., but otherwise plan on bringing a raincoat or umbrella along with you! Tomorrow will be another cold and wet day, so keep that umbrella handy! Temperatures slowly rise and reach a high of 41 degrees F around 4 p.m.. Rain is forecasted all day tomorrow with expected accumulation around 0.5 inches. Winds remain light and from the east. Temperatures remain in the high 30s throughout the night, and the rain is expected to taper off in the early hours of Wednesday. Cloud cover drastically reduces once the rain stops, and winds increase to around 5 to 10 m.p.h. from the east. The rain clears out by Wednesday, and a cool, partly cloudy day is expected. The rest of the week looks similar, with cloudy days throughout Friday and temperatures staying in the high-30s and low-40s. Rain is expected to start again Friday afternoon and continue throughout the weekend! Indoor activities may be the best plans this weekend! 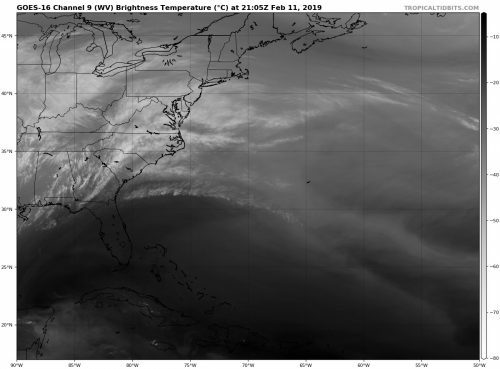 Water Vapor satellite imagery over the Atlantic Coast.